So Ary tell us about you. Where are you from and how long have you been president of the AFCC for? You might say I came out of nowhere. I had been in AFCC only a few months, when after the AGM the elections took place. The president at the time decided to resign and yours truly was duly elected. It was probably was my own fault, because I found that a monthly meeting was not enough if you wanted to have a reasonable chance to practice. So I organized a Meetup to alternate with the AFCC meeting. That was in February 2014. I found there was a reason that the former president wanted to get out: Paris had decided that only Capital cities Alliances would be supported from then on, so we had to reorganize. It meant writing a new Constitution, organizing our own insurance, dealing with ACNC and the Tax Department. So, a lot of work. Having spent 15 years in Toastmasters and being on the executive there for 14 of those, and president for 3, I was not entirely unprepared. In those 4 years the committee has reorganized the Rendez-vous to have 3 separate groups, previously there was just one. I noticed that native French speaking visitors did not find much to enjoy, so they did not come back. That was the start of Club Causerie to have an informal setting for them and for the more advanced speakers. We also organized a banner, a waterproof Marquee, table with tri-colour cover for expos, to name a few. Of course, as a committee member we work as a collective in our decision making. When and where did you start speaking French and what is the story behind? French was a compulsory subject at school. By the time I was 13 I discovered during holidays that it was actually useful, because you could communicate with people from other countries in their Language. I soon had built up a collection of pen friends in England, France and Germany. Later I spent 3 months in Auvergne when I was in the Army. It resulted in another pen-friend, a retired French teacher. I lost contact with all of them when I was travelling around Australia. Any particular memory of France or somewhere in France you cherish? From what I have seen I liked Normandie, I got as far as St Malo in Bretagne. I have passed through the Vosges, which struck me as a rather poor area. What tips would you give to beginners starting to speak French? I would watch TV5Monde via Internet (http://www.tv5monde.com/). Under the heading “Apprendre le Français” you find a series of programmes graded according to ability (A1, A2, B1, B2). These are accompanied by transcriptions in French, Double-clicking on a word gives the translation in your nominated language. These programmes are organized by the Alliance Française. Any address on the Coast where you find French treats/restaurant/culture? No idea, I don’t live on the Coast. 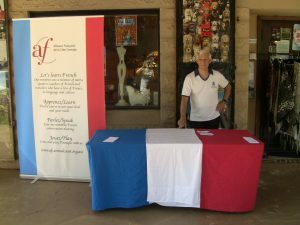 Well, at least we had the Alliance Française Film festival in Avoca Beach theatre. This entry was posted in Interview, News, Newsletter and tagged Interview, news, newsletter on April 18, 2018 by admin.